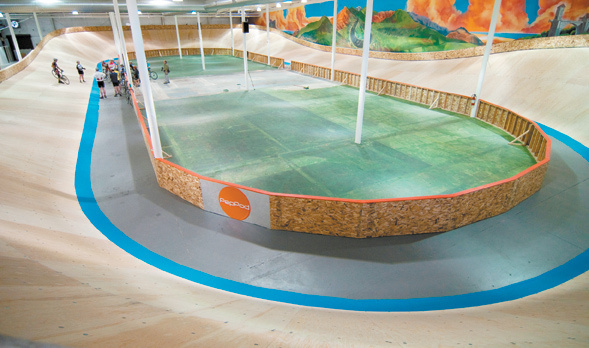 From underneath the plywood banks of the velodrome at Boulder Indoor Cycling, the deep rumbling each time a rider goes by sounds like a freight train overhead. One recent Wednesday afternoon, I stood with friends waiting to ride and listening to that now-familiar roar, but this time it was punctuated by a man’s voice yelling in ecstasy—“Oh my God!”—followed by the echo of another man’s laughter. When the rider stopped to take a break, we entered the track and asked the laugher what exactly had been going on. “Oh, it’s his first time on the track,” he explained. We watched as the first-timer flew up the sides of the banks and accelerated back down with skill far beyond that of a novice. Watching him ride was like watching Baryshnikov revel in a new dance step. He glowed. And he was smiling ear to ear. Ah, of course, I thought … the grin. “It doesn’t look like his first time,” I said to his friend. Track riding is akin to track running—but add a massive dose of physics. 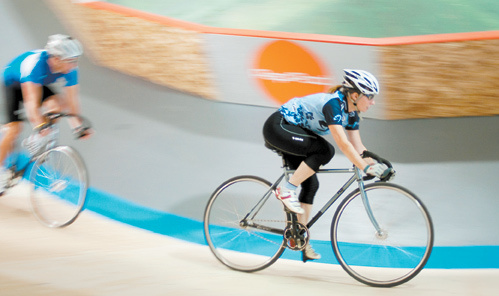 A cycling track, or velodrome, is banked, requiring a minimum speed to stay upright. It calls for fixed-gear bikes and brakes are not allowed. (Strange as it may sound, this is for the safety of everyone involved.) These elements combine to give track riding a unique physical sensation (the closest comparison is mountain biking on a banked berm). Holding steady in the grip of centripetal forces feels pretty trippy the first few times around. Although many consider velodrome races to be the marquee events for cycling in the Olympics, the reality is that track riding in the United States has been relegated to fringe status. Yet back in the day, long before there was NASCAR, track cycling was the circular spectator sport for the masses. When Madison Square Garden first opened in 1879, it was a velodrome. In the late 1890s, one of the best known and highest paid athletes in the world was Major Taylor, an African American track cyclist. His winnings for 1902 totaled $35,000 (that’s more than $800,000 in today’s dollars). In that era, the U.S. had more than 100 velodromes, with at least one in every major city. Today Europe maintains that level of enthusiasm, but here the sport has inexplicably faded from the public eye. In America, it’s now only available—to watch or to ride—to those who happen to live in proximity to one of this country’s 26 tracks. Despite the velodrome’s fall from prominence, Boulder always seemed like a pretty obvious place to have one, given the town’s feverish enthusiasm for two wheels and fixed gears. The lack of track wasn’t for lack of trying. Over the years, plans came and went for an outdoor cycling track in Boulder, Lyons, Erie and other Front Range towns. At one point around 2000, there was a letter of intent for one to be built at Boulder’s Valmont Park (which will instead be the home of a mountain bike, BMX and cyclocross dirt park, currently under construction). But all those plans fizzled with insufficient start-up capital. With a grand opening on January 3, 2009, Boulder Indoor Cycling (BIC) accomplished something that other groups had tried and failed to do for at least two decades. So how did BIC succeed where others could not? To start, it was a private business planned by men who were not cyclists. Previous efforts were driven by cycling purists, who had clear visions of what, how and where their tracks should be built. They sought to build conventional tracks, outdoors, on city property. To be honest, the track at Boulder Indoor Cycling is a few notches beneath what track veterans are used to—a fact many of the seasoned riders who come here make clear before plunking down $20 for an hour of riding. But 60 minutes later, even they walk out with embarrassingly cheesy smiles. The author shows the guys how to go fixie without fear. At 142 meters, the oval is considerably shorter than most, which typically measure 250 meters or 333 meters and are easier to build as outdoor tracks. Modeled after a 138-meter indoor track in London, Ontario, BIC is one of a handful of pint-sized tracks in the world (for reference, its infield is about the size of a basketball court). Keeping the track small made it much more feasible to build indoors. Its length also creates a steeper bank and tighter corners, resulting in more of an amusement park whip kind of ride. By using plywood instead of pine for the track surface, BIC owners were able to keep the costs down and get the business up and running. They took a gamble that their primary target user wouldn’t care. I admit that I am one of those people who fuels cycling—one of the masses—and I love the new track. As a road rider, I raced my first criterium in 2007 (a criterium is a fixed number of laps around a course shorter than 1 mile). Even in Cat 4 —the beginner’s category—I got lapped. I tried another crit in 2008. This time I won. Then everything changed. I felt like I owed it to myself to take cycling more seriously. The idea of upgrading to Cat 3 shifted from being an absurdly impossible goal to remotely within reach. Suddenly, I had a new passion and the double-income/no kids bank account to fund it. I bought what I like to call my “mid-life crisis bike.” I took the pretty good components I already owned and bought a hand-built titanium Moots frame. Had I walked into a bike store and bought the whole thing at once, it would have run about $6,000. But hey, I was about to turn 40 and had just won a crit. What would you do? I started scheduling work meetings around my training schedule. I continued to do well at races: second place at the Bannock Crit, first at the North Boulder Crit, third place at the Summer’s End Road Race in Deer Trail. Soon, I had more than half the points I needed to upgrade. In a few short months of bike racing, I became so preoccupied with upgrade points that I was willing to cut back on my usual 50–60 ski days to spend more winter time riding. call us at 303-CYCLING and we will answer all your questions. We are located on Pear St and Frontier Ave. In Boulder.